Thermal paper, once mainly used as fax paper only, is now used in many applications. 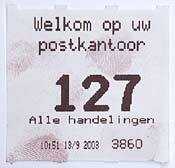 These days it is used in ticket dispensers for giving out queue numbers or parking tickets, in label printers, and printers for point-of-sales receipts at retail shops like supermarkets. 1,2-IND (as a 2 g/l solution in HFE-7100 containing 7% ethyl acetate) has been reported to develop fingerprints without darkening the top (active) layer of the thermal paper (John Stimac, Journal of Forensic Identification, 2003, 53(3), 265-271). For finding and photographing the developed prints a Polilight or similar light source is needed. DMAC (dimethylaminocinnamaldehyde) fumes react with fingerprints on thermal paper (see e.g. Brennan et al., Journal of Forensic Identification, 1995, 45(4), 373-380). The fluorescence of any developed prints can be photographed with green light (Polilight, around 530 nm). 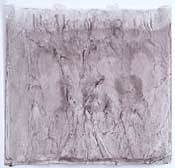 Exposure to the fumes of concentrated hydrochlorid acid was reported to develop prints on the top layer of thermal paper (Broniek, Knaap, Journal of Forensic Identification, 2002, 52(4), 427-432). It will not develop prints on the back of thermal paper. Treatment with a regular ninhydrin solution and after allowing ample time for development of fingerprints, rinsing the paper with an excess of acetone to remove all the text and/or grey-black stains. Japanese researchers have published that hemiketals of ninhydrin, obtained by exchanging the water molecule in ninhydrin [also known as 1,2,3-indantrione monohydrate] for an alcohol, are soluble in apolar solvents like petroleum ether without the need for addition of polar solvents. The solutions were reported to develop fingerprints on thermal paper, without darkening of the surface. Such a product (named ThermaNin) is now available from BVDA. Contrary to our expectations, ThermaNin was found to have a very low solubility in HFE-7100. Therefore working solutions of ThermaNin cannot be made in HFE-7100 alone. However, preliminary experiments [July 2004] indicate that stable solutions, even in glass bottles, can be made by adding 0.5% isopropanol and 1.5% ethyl acetate as co-solvents. This solution does not color the active layer of thermal paper. A working solution can be made quickly, by weighing 0.4 to 0.5 gram of ThermaNin and adding this to an empty 100 mL bottle (glass or aluminium). Adding 0.5 mL of isopropanol and 1.5 mL of ethyl acetate will dissolve the ThermaNin, subsequently dilute to 100 mL by adding the HFE7100.